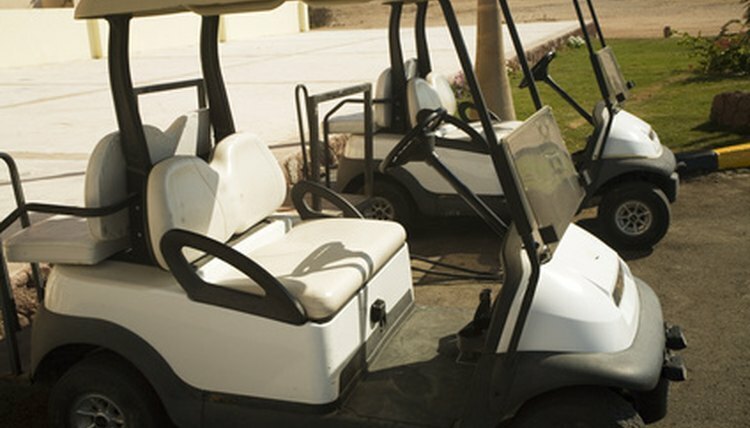 Golf cart seats can easily get dirty but are effectively cleaned in a few simple steps. The seats are very important parts of your golf cart. Since they are often exposed to the elements when in storage or when out on the course, it’s important to clean them regularly. This not only keeps your golf clothing from getting stained; it also helps your seats last longer. Most golf cart seats are made of vinyl, which is fairly easy to clean. Many also have removable seat covers for added comfort and quick cleaning. Remove your seat covers, if applicable. Set them aside. Fill the bucket with four cups of lukewarm water and two teaspoons of mild dish soap. Stir. Dip a cloth in the solution. Wring it out. Wipe down the tops and sides of the seats. Use an old toothbrush for any seams where the cloth won’t fit. Rinse, using another cloth damp with water only. Dry the seat with a third cloth or let it air dry. Continue to Step 3 if you have a removable seat cover. Place your seat covers back on the seats. Clean cloth covers using a carpet cleaner. Apply a teaspoon of the cleaner to your cotton cloth and use the cloth to scrub stains in a circular motion. Clean synthetic leather covers using the instructions in Step 1. Rinse the seat covers and let them air dry. Do not use more water then you need, as it could seep through to the seats underneath and lead to mildew growth.